This entry was posted in NAA Live Archives and tagged 2014 Leadership Conference, Andy Albright, Andys Live Show, Bill Cook, Dane La Vigne, Gina Hawks, Mike Lewantowicz, NAA, National Agents Alliance, noelle lewantowicz, The Alliance, The Live Show, The Wednesday Call Live, TWC. Bookmark the permalink. The Wednesday Call (TWC) for September 30, 2015: Andy Albright was fired up to host another episode of The Wednesday Call live from Alliance headquarters in Burlington, N.C.
More than 175 people were in town to spend time at the home office and to attend the live TWC and spend the day at the office for a special open house. Andy was joined by a special guest host Noelle Lewantowicz, who is one of the top female leaders with The Alliance. 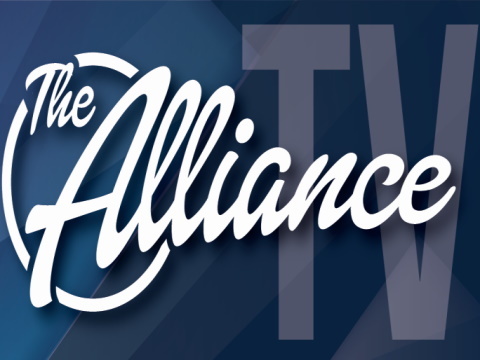 Albright opened the show by covering the various contests going on with The Alliance and its trusted carrier partners from now until the end of 2015. Lewantowicz and Albright discussed the ways you can be one of the top female members of The Alliance. Albright challenged all members of the Alliance to spend the next week focused on doing the three things inside of what we DO (Sell, Recruit and Build) in our business. Can you say "no" to people and things for a week in order to hit your goals? The three things are: goal setting, having enthusiasm and executing the "DO." We are trying to all do the same thing, at the same time and for the same reason. That gets us freedom, dreams and a legacy. The first step is to set goals. A big part of that is figuring out your schedule and the activity needed to hit your goals. Most people want freedom, and it takes money to make that happen. Another way to do this is by getting away from people that prevent you from being the best version of yourself. The second key is to show enthusiasm as you go through the week. You need to be excited about what you are doing the whole week. Get around other people who seem to always be excited about everything. You can do this by smiling, moving your hands, sharing encouraging words with people, etc. Keep telling yourself that it is show time, game time, grind time, etc. It takes a lot of work and effort to do this, but you have to make yourself do it. The third step is to simply get to work. Do the DO! Get out there and be willing to sell, recruit and build. Be accountable to yourself and others. Endure the pain of rejection until it becomes success. Spend the next week running hard and see what happens for you. The Live Show will air again on October 7, 2015 at 12:30 p.m. EDT.